Recently I was asked by an administrator to help him automate the process of joining ESXi Hosts or as PowerCLI refers to them “VMhosts” to a domain and granting permissions for a domain user with PowerCLI. In this post I am going to show you how this can be done with a few lines of code and also share my lessons learned throughout this process. Let’s assume that you have list of VMhost IP addresses and all VMhosts have the same local administrator credentials, you want to join them to a domain and grant permissions for a domain user or group account assigning it a specific role. In the script I assume the role exists on the VMHost but later I will show you how to create a custom role. The Set-VMHostAuthentication cmdlet is used for joining a VMhost to a domain. You should have in mind that the full domain name must be specified on the Domain parameter of the cmdlet. The New-VIPermssion cmdlet is used for creating permissions for a specified user. The user is obtained with the Get-VIAccount cmdlet which has the ability to retrieve Domain user or group accounts when the VMHost is joined to a domain. In contrast to Set-VMHostAuthentication the Domain parameter of Get-VIAccount expects the domain alias instead of domain full name. You should also be aware that if you don’t specify an Id filter to the Get-VIAccount cmdlet it returns the maximum 5000 results and for domains with many accounts this could be a constraint. So it is recommended to use Id filter of the cmdlet itself instead of applying filtering over its results. To obtain domain user accounts use –User switch. To obtain domain group accounts use –Group switch. To grant permissions you should specify account to Principal parameter returned by the Get-VIAccount cmdlet, role which can be obtained by Get-VIRole or specified by name and entity which in our case will be the VM host. As you can see the script opens a connection to each VMhost, joins it to the domain and creates permissions for a specific domain account. It relies on the existing role on the VMHost, but it can be easily modified to create a custom role and assign it to the obtained user. The script is calling the Get-VIAccount with a –User switch parameter which filters on domain user accounts. In order to retrieve a domain group account the –Group switch parameter should be used. So the script looks pretty simple and straightforward but running it I’ve experienced the following problem. Sometimes Get-VIAccount failed to retrieve the domain user immediately after joining the VMhost to the domain and I received the following error “Error accessing directory: Can’t bind to LDAP server for domain: <DOMAIN>”. It seems that synchronization with active directory needs some time after a host is joined to the domain and the problem is not 100% reproducible. So I solved it with a simple retry-wait mechanism on retrieving domain users. Sometimes Get-VIAccount fails to obtain domain users immediately after a VMhost is joined to a domain. Dimitar joined VMware and PowerCLI team in the beginning of 2011. He is member of the quality engineering part of the team and his main role is the functional verification of the vSphere, vCloud and License PowerCLI components. 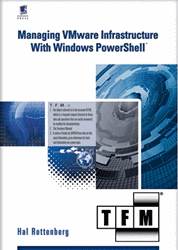 This entry was posted in Advanced, General and tagged PowerCLI, PowerShell, VMware on April 30, 2013 by Alan Renouf. Very useful post Dimitar ! This question pops up quite regularly in the PowerCLI community. To make sure, is that 5000 objects a Get-VIAccount builtin limit or an AD limitation ? Any chance this would be changed in any of the future PowerCLI releases. And with the Domain Alias I suspect you mean the NetBIOS name ? Any thoughts on making the Domain parameter more consistent across cmdlets in a future PowerCLI release ? 1. The limit comes from the server. The is the default limit of query results. As far as I know it is adjustable through advanced settings. I made a note because using the built in filters will be faster than retrieving all users/groups and then performing filtering and I am not sure how many people are aware of the server limits and how they can be adjusted. 2. Yes, this is the NetBIOS name. 3. Definitely they should be consistent. It is good request for enhancement and I’ve already filed one for future PowerCLI releases. massage clothes as opposed to washing them. ( or where-ever) that offered this vending machine service:. features a white epoxy finish. I am hopinng to vview the same high-grade blog posts from you in the future as well. Hey pas bête. Sinon une agence bien professionel avec des prestations référencement c’est Dream Developpement. you have list of VMhost IP addresses and all VMhosts have the same local administrator credentials, you want to join them to a domain and grant permissions for a domain user or group account assigning it a specific role. In the script I assume the role exists on the VMHost but later I will show you how to create a custom role. Really! very useful post.. For general knowledge, u know.. codes you provided are awesome. I hope I can make use of those.. Peace man!